By 1930, thirty-five states had officially designated state flowers or floral emblems to represent them. Only thirteen states had not yet taken action. By 1930, only eleven states had adopted official state birds. Thirty-seven states were "birdless," symbolically at any rate. Of those eleven states, three had adopted the western meadow lark, two had adopted the mockingbird and two had adopted the cardinal. Spurred on by women's clubs and societies throughout the country, the trend to adopt the wonders of the natural world was not a trend that would soon diminish. Arizona, the youngest member of the Union at the time had neither a state flower nor a state bird. It was surely on the "to do" list of the local state bird or state flower committee of the Arizona State Federation of Women's Clubs, for the General Federation of Women's Clubs was to hold its Biennial Council in Phoenix from April 27 to May 2 and it had been suggested that a state bird be elected before the event. A campaign was initiated. We might assume that it included polls and surveys for it's stated in Jonathan Duhamel's article in the Arizona Daily Democrat that " The cactus wren won by a landslide." House Bill No. 128 carried the proposal for an official state bird and an official state flower through the Arizona State Legislature. According to our sources, the Coues' cactus wren "was officially designated the Arizona State Bird by legislative action on March 16, 1931" or" was designated as the State bird of Arizona by an act of the State legislature approved on March 16, 1931." Ordinarily, for an act of the legislature, we list the "adopted" date as the date the legislation is approved by the governor of a state. In this case, it is not clear to us what activity the March date represents. Is it the date of final activity by the Arizona State Legislature or is it the date that the legislation was approved by the governor? Regardless, Arizona did the original suggestion one better and designated an official state bird and an official state flower before women's club members from across the country gathered in Phoenix. Arizona was one of seven states that adopted official birds in 1931. 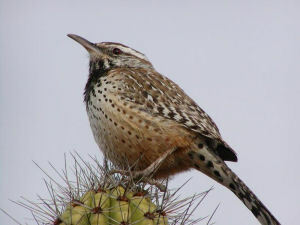 Note that the preferred scientific notation for the cactus wren is Campylorhynchus brunneicapillus couesi. The following information was excerpted from the Arizona Revised Statutes , Title 41, Chapter 4.1, Article 5, Section 41-854. 41-854. State bird The cactus wren, otherwise known as Coues' cactus wren or Heleodytes brunneicapillus couesi (Sharpe) shall be the state bird. Arizona Revised Statutes, (http://www.azleg.state.az.us/ArizonaRevisedStatutes.asp),April 6, 2005. Animal Fact Sheet: Cactus Wren: Arizona-Sonora Desert Museum. 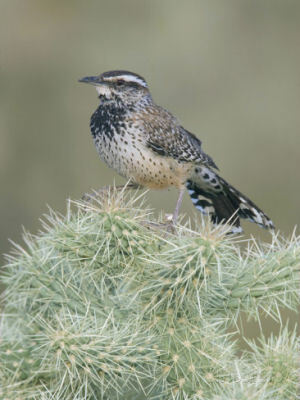 Arizona’s Audacious State Bird, the Cactus Wren : Tuscon Audubon Society: Article by Bob Bowers. Who'd Choose a Cactus Wren as Arizona's State Bird? : Foothills Community Foundation: Article by Jim Blackburn. Cactus Wrens - Arizona's Very Noisy State Bird: Arizona Daily Independent: Article by Jonathon Duhamel. Campylorhynchus brunneicapillus couesi - Sharpe, 1881: A network connecting science with conservation - NatureServe Explorer: An Online Encyclopedia of Life. Campylorhynchus brunneicapillus couesi Sharpe, 1881: Integrated Taxonomic Information System (ITIS) Here you will find authoritative taxonomic information on plants, animals, fungi, and microbes of North America and the world. Cactus Garden captures the delightful and heartfelt poetic expressions of a young child who attentively explores his or her prickly garden--the Sonoran Desert. Twenty enlightening poems, enhanced with thought-rovoking sketches and child-friendly facts, celebrate this amazing desert with playful and engaging rhyme that even the youngest child can enjoy. An absorbing combination of feelings and facts focus on both the ordinary and extraordinary. From making prickly pear jelly on a hot summer day, to getting "hugged" by a teddy bear cactus, Cactus Garden will stir feelings of happiness, wonderment, and compassion in children of all ages, including the young at heart. The Grand Canyon State consists of a mountain chain, heavily forested and rich in minerals extending northwest to southeast with desert occupying the southwest. Arizona harbors a vast diversity of wildlife including 551 species of birds. This beautifully illustrated guide highlights over 140 familiar and unique species and features a back panel map of the state's eco-regions and most prominent birding hotspots. Laminated and pocket-sized, it is an ideal field reference for residents and tourists alike. Make bird watching in Arizona even more enjoyable! With this field guide, bird identification is simple and informative. There's no need to look through dozens of photos of birds that don't live in Arizona. This book features 145 species of Arizona birds, organized by color for ease of use. Do you see a yellow bird and don't know what it is? Go to the yellow section to find out. Fact-filled information, a compare feature, range maps and detailed photographs help to ensure that you positively identify the birds that you see. Like its predecessors, this guide provides birders with quick and easy access to the kind of specific facts and savvy advice that they need: a regional map of birding hotspots; a knowledgeable introduction by a local expert on which birds to look for, where to find them, and what to focus on when they appear; a section on birding basics, field identification, and how to make the best use of the guide and its resources; scores of individual entries with photographs of each bird, recognition tips, and notes on behavior, habitat, and particular sites; and two indexes: one color-coded, the other alphabetical with life list boxes. An ideal solution for visitors looking to make the most of limited time and a valuable reference for anyone who lives in the region, these books belong in every birder's library, beginner and veteran alike.